ARSENE WENGER WILL step down as Arsenal manager at the end of the season, leaving behind a legacy as one of the Premier League’s great managers after a remarkable 22 years in charge. “After careful consideration and following discussions with the club, I feel it is the right time for me to step down at the end of the season,” the Frenchman said in a statement this morning. Now aged 68, Wenger was just 46 when he was unveiled as Gunners boss on 22 September 1996, and went on to guide the North London giants to three Premier League titles and seven FA Cups. The pinnacle of his achievement unquestionably came in the 2003/4 season when he guided his ‘Invincibles’, loaded with the talent of Dennis Bergkamp, Thierry Henry and Patrick Vieira, to the title without losing a single league game. But the sheen on his legacy was dulled somewhat by Arsenal’s recent dip in fortunes as they failed to return to the heady heights of the late 90s and early 2000s, leading to discontent among a growing section of fans who agitated for Wenger to step down. “This is one of the most difficult days we have ever had in all our years in sport,” majority owner Stan Kroenke said as he vowed to build on Wenger’s ‘remarkable tenure’. In his own statement, Wenger said: “I am grateful for having had the privilege to serve the club for so many memorable years. I managed the club with full commitment and integrity. 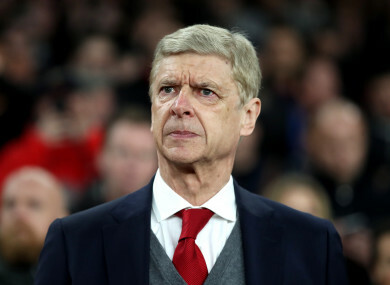 Wenger will remain in charge for the final five games of the Premier League season, starting with Sunday’s derby against West Ham, as Arsenal bid to secure the top-six finish that would guarantee them a place in European competition next season. More importantly, the Gunners face into a mouthwatering Europa League semi-final against Atletico Madrid, knowing that victory in that competition would also bring with it a place in next season’s Champions League – irrespective of their league finish. Arsenal say that they intend to appoint Wenger’s successor “as soon as possible,” with the early betting markets listing Vieira, Carlo Ancelotti and Thomas Tuchel among the likely candidates. Kroenke, who became Arsenal’s majority owner in 2011, said: “One of the main reasons we got involved with Arsenal was because of what Arsene has brought to the club on and off the pitch. His longevity and consistency over such a sustained period at the highest level of the game will never be matched. Email “Arsene Wenger to step down as Arsenal manager at the end of the season”. Feedback on “Arsene Wenger to step down as Arsenal manager at the end of the season”.